BRIDGEi2i is an Analytics Solutions company partnering with businesses and institutions globally, helping them achieve accelerated business IMPACT harnessing the power of INFORMATION. BRIDGEi2i is focused on helping companies build the BRIDGE from INFORMATION to INSIGHTS to IMPACT. • INFORMATION – Manage and leverage large volumes of data, from sources inside and outside an organization, to provide meaningful information about the business. • INSIGHTS – Mine the data with sophisticated data-mining and machine learning techniques and tools to identify underlying insights. • IMPACT – Leverage the identified insights to make meaningful changes in the business strategy to realize incremental top-line or bottom-line impact. 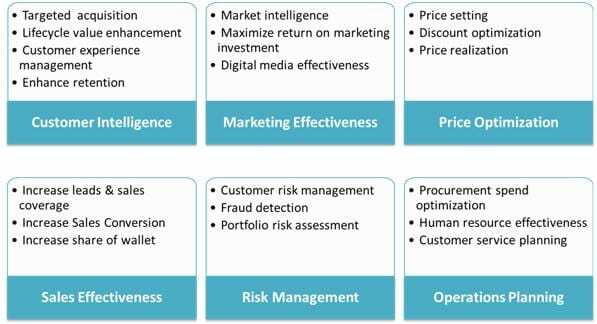 BRIDGEi2i intends to elevate enterprises to a new gradient of informed decision making, enabling them multiply value manifold. The power of analytics in transforming businesses is unassailable and BRIDGEi2i would like to be the catalyst in bringing about that change. BRIDGEi2i provides Analytics solutions to help solve complex and unstructured business problems using Analytics and enabling businesses to institutionalize data based decision making. BRIDGEi2i offers intuitive and customizable Analytics Apps targeted at specific business needs to simplify the process of deriving actionable insights from data.